Everyone Deserves A Chance! At Jumpstart Humanity, we want to spread our message of hope and compassion. We seek to provide relief to every man, woman and child who does not currently have safe, stable housing, necessary medical care, and adequate nutrition. Every donation we receive goes directly to those in our community who need it most. With your help, we our strengthening our community, one person at a time. the vast MAJORITY of work, time, and energy expended during the term working on JumpStart humanity has been spent on the PREPARATION needed for the organizations official opening. over the last year, what first had started out as a thought, MERELY an idea. has grown into fruition in a real, exciting, and very TANGIBLE way. With spring around the corner, our hope is to flourish into, and find our place community where we can become just yet one more positive addition to this ALREADY BEAUTIFUL world! creating the website was one of the most important preparation steps. Now that it is up and running, volunteers, DONORS, and any individuals interested can gain insight to better understand our mission STATEMENT. see what the driving force behind why we do what we do. how we do it, and have as much transparency as possible when it comes to where any aid we RECEIVE is going. As well as what is needed in the community, the organization, and how they can help! A facebook page, as well as other social media accounts, is similar in importance to the website. In fact, a social media account gets people closer to the nonprofit. cards were desinged and ordered. They weren't bad. However, everyone involved in the process agreed that they would "get the job done". Since they contain all of the relavent information needed, but that was about it. So we went back to the drawingboard and have yet to order the new design and would love and appriciate any feedback we can get today before doing so! T-shirts, hats, pens, flyers, etc. are a one of the ways that the name of the organization can get exposure and therefore what EXACTLY it is that JUMPSTART humanity does. whenever an event is hosted by jumpstart humanity, a DONATION is made, someone VOLUNTEERS, or VISITS the website, people can end up with something that reminds them of the nonprofit. one of the most important needs for jh to grow as a new nonprofit is funding. And there are multiple approaches to get people and companies to consider supporting and helping jh financially. thus, so much time was spent on brainstorming, and coming up with realistic, efficient, and successful fundraising ideas. there was not enough time to EXECUTE these ideas. However, they will be utilized and built UPON after the term. I have learned much more over the term than I honestly had expected or that I could have hoped for. mainly from working and becoming friends with mustafa, the design input, and insight on how the information we display should be done and will be INTERPRETED or viewed. as well as from both listening to and speaking with everyone in our class. my experience working towards becoming an effective change agent has UNDOUBTEDLY made a POSITIVE impact on me and INADVERTENTLY has made a direct correlation to how will view and approach my interactions with individuals both personally and as a REPRESENTATIVE of the organization, because of a growth and WIDENING of my own perspective. how I can apply and relate that towards a better understanding of the vast number of different perspectives of other individuals. working with christopher and andrew on preparing jumpstart humanity for its official opening has been nice. when i first knew i had to volunteer for the class, what i was looking for in volunteering was the experience of direct contact with people who needed help, especially children. 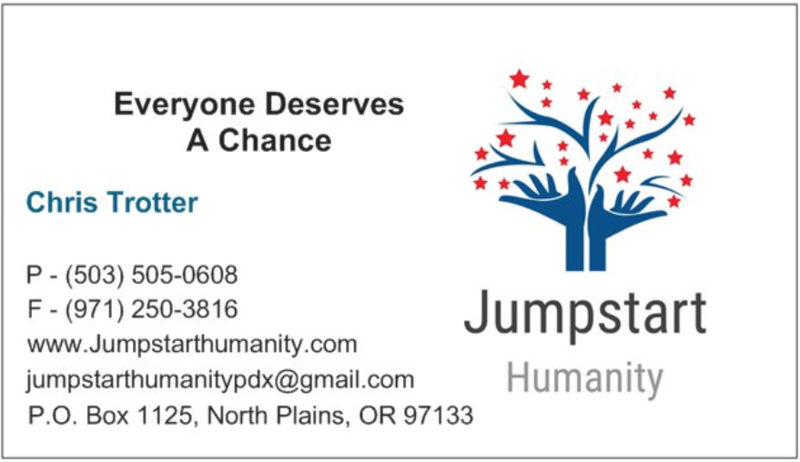 Unfortunately, jumpstart humanity has just officially opened, which means we spent most of our time making sure everything is ready to start looking for people who needed help. But we still have not officially helped any. this is the only part that is slightly unsatisfying. but in general, i enjoyed working with christopher and andrew, and i will be working with them a bit more after the term as well. I am happy with what jumpstart humanity has accomplished so far, and i cannot wait to see more accomplishments as time goes by!